Playing competitive poker has been a major source of income for quite a few residents of Iowa. Blair Hinkle is the top poker earner in Iowa from comprehensive tournament data. He has won over $340 thousand dollars in competitive poker winnings. That is made possible by the multiple state-sanctioned poker rooms that are available in the state of Iowa, but only in part. A competitive poker player can only hope to see 30-40 hands per day in a brick-and-mortar casino. With legally regulated US online poker rooms, they may be able to see thousands. This is a guide to online poker websites has been designed to detail all the information that you are probably searching for as you seek out legally approved online poker options. This guide was meant to function as a trusted resource for online poker players to find the information they need regarding the confusing legal landscape, industry standards, software availability, game selection, and even banking options. 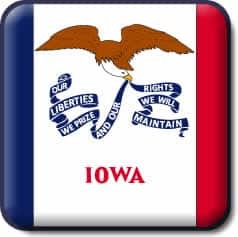 Continue reading to understand what you should expect as a consumer in the ever-evolving international markets of legally regulated online poker rooms and how state and federal gambling regulations intersect with the Iowa online gambling industry. Are Online Poker Sites Legal In Iowa? Yes. As long as an online poker site is legitimately licensed, subject to regulatory oversight by a legitimate governing jurisdiction, there are not any Iowa state gambling laws or US federal gambling laws that make it a crime to play poker online at these destinations. In the United States, gambling laws are left largely up to the state but there are yet a few federal laws that are thought to impact the online gambling markets. The Unlawful Internet Gambling Enforcement Act is a federal bill that was designed to keep the banking institutions that are inevitably involved with online gambling in check. In 2011 the DOJ established that the Federal Wire Act only applies to state based sports betting and therefore does not prohibit online poker at a state or federal level. At the state level, online gambling must be specifically legalized before the state can issue any relevant licecnsing. This has forced online poker businesses who wish to remain in favorable legal standing with the customer markets of the United States (and the rest of the world for that matter) to seek proper international locations for their businesses in order to acquire the proper, legal regulation. Below you will find a list of websites that we have vetted and scrutinized over a lengthy period of time for the purpose of providing direction concerning legally sanctioned, highly secure online poker sites. All of the poker rooms on this list have the proper licenses, compliance certifications, and legal regulation as per their geographic locations to operate legally in the American consumer market. They have been double checked on third party websites to gain insight into their reputations and customer service reliability. Their banking suites are secured by SSL data encryption and they each have a team of computer specialists on call to safeguard you from any potentially malicious digital attacks. This is our list of approved legal online poker sites. All the variations of poker that you normally find in a brick-and-mortar casino can be found on the internet at any of these sites. You’ll find Stud poker with 3, 5, and 7 cards, Omaha poker, including Hi/lo, Texas Hold’Em, and 32 Card Draw, all with options to play at varying stakes for high, medium, and low bettors. All of these games will be available in an online gaming lobby format. In addition, you’ll find other interesting online poker games including HORSE, RAZZ, Caribbean Stud and more. Each brand in legal online poker has had their own proprietary software solution that houses their game library. This has been that leading factor in competitive poker that we were talking about in the intro. These desktop applications have been developed for you to multiply your games and streamline your experience into the most poker you can possibly cram into the little time you have to enjoy yourself. We recommend that a major focus in your decision on which website to patronize should be on how well you enjoy their poker software. You will find impressive player tools and a feature-rich interface that maximizes functionality. The poker sites listed in this guide all offer an active and diverse tournament suite. You’ll find tournaments around the clock, a nice range of buy in levels, free rolls and a substantial offering of promotions. The tournament side of online poker is also where you will often find qualifiers for live events, such as the WSOP and other prestigious tournaments. Chris Moneymaker won his WSOP seat from a qualifier tournament game at an online poker site. Free play has emerged and is widely available at most online poker sites. In some cases, the way that this is accomplished is by a toggle button that indicates play money vs real money. You’re still playing against real people, but the toggle button might say something like “play money” as opposed to its opposite button “real money”. You will be given hypothetical money to bet with and in this way, you can try out the systems and get to the know the digital interface before you gamble any real money. It functions as an excellent way for novice players to get to know the dynamics of playing poker in general, much less doing so on the internet where you can’t physically see your opponents. It also functions as a way for experienced players to test out new betting strategies without any real risk to their finances. There are also the freeroll tournaments. These are tournaments that are offered by many legal online poker rooms that offer a no buy in tournament format where you can still win real money. This way you will not have to spend any money on entering the tournament and if you play your cards right, and follow all the wagering requirements you may be able to walk out of there with a profit! The bonus that you will notice the most frequently and has become something a customer should expect from any reputable online poker room is the “Welcome Bonus”. This is a bonus that adds to your first deposit by whatever percentage the poker room has assigned. It’s your first deposit so these websites want to make it even larger. You might see something along the lines of “50% Welcome Bonus”. This means they will take 50% of your deposit and match it in your initial deposit just for signing up to their website over their competitors. The bonuses are awarded incrementally – meaning the more you play, the more of your bonus money is unlocked. Thanks to new developments in programming languages, online gambling service providers no longer have to deal with finding hosting for their apps. The Google Play Store and the iPhone’s App Store have refused to let US friendly apps that are solely for gambling into their marketplaces despite allowing fantasy sports betting. With HTML5 programmers no longer need hosting. Online poker applications are now web based, mobile optimized versions of their website that are compatible with most mobile devices, operating systems and networks. You will be able to manage your account, play games and request withdrawals with these mobile poker applications. The options for making deposits and withdrawals vary from brand to brand. The most common deposit options are Bitcoin, and major credit cards including Visa, MasterCard, Discover Card and American Express. Bitcoin can trace its origins back to the beginnings of the online gambling community and at one point it appeared as if that was going to be the primary function of the digital cryptocurrency. Now, however, its reach has expanded far beyond online gambling markets but it acts as the easiest and most reliable form of money transfer into these sites with no processing times or fees commonly associated with it. If you’re not familiar with the use of Bitcoin, there are plenty of other options that are made available to you. Bank to bank and person to person wire transfers using companies like MoneyGram and Western Union are popular options and it’s not uncommon to see website’s offer even more options like sending and receiving paper checks.